We all like to think of ourselves as well-rounded. Remember in school if you majored in let’s say music, you also had to take math or science class. School administration wasn’t doing this to annoy you, but rather instill the same core values so everyone was on the same level. Sounds simple enough, right? “I used to get made fun of for being either too provocative or too eccentric, so I started to tone it down. I didn’t fit in, and I felt like a freak,” she recalled. Even at a young age, Lady Gaga was our inner spirit animal, and now we have more in common with her than you might think — back pain brought on by fibromyalgia. “I hid my injury until I couldn’t walk,” Lady Gaga told Arthritis Magazine. “I had a tear on the inside of my joint and huge breakage. We all know too well the ins and outs of chronic pain and now we share that with the queen herself who not only suffers from fibromyalgia but also synovitis, a painful inflammation of the joints from a hip injury at one of her earlier concerts. Lady Gaga’s inspiration and strength to press on and share her story comes from the life of her aunt Joanne, who died from lupus at the age of 19 before the singer was even born. Although they never met, Lady Gaga has always felt a connection to her late aunt, who was the inspiration for her newest album. Lady Gaga’s pain is so bad, she cannot walk or get out of bed on the bad days, making her just like some of us. She has her bad days; we have our bad days. And we both have our good days. We sometimes feel more than physical pain — we feel the mental strain that the chronic pain places on us and how it can decrease our quality of life. What we need is a balance of the two and if you need just that, take inspiration from her story. 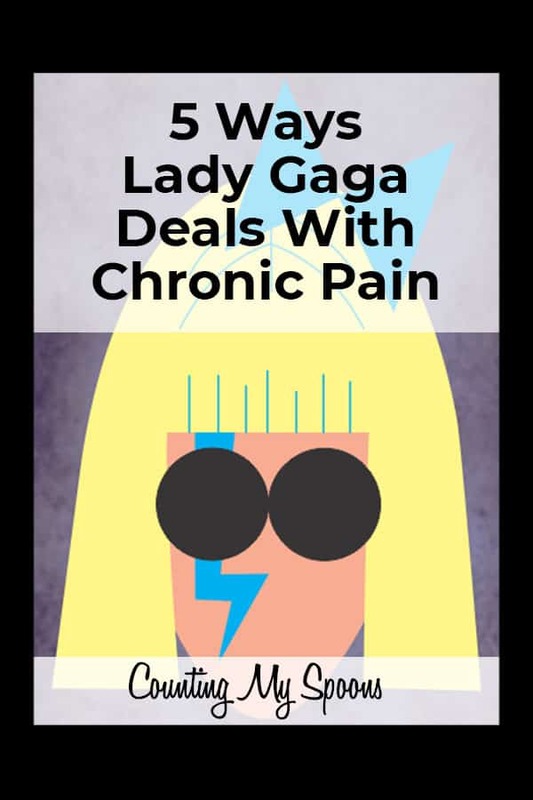 Lady Gaga is well known for her over-the-top EVERYTHING, so you would think that would carry over into her pain regime — and guess what people, it does, which is why we are so excited to provide you back pain remedies as told by Lady Gaga. “I was so overwhelmed by the empathy, confessions and personal stories of chronic pain in response to my previous post I thought what the hell. Maybe I should just share some of my personal remedies I’ve acquired over the past five years. Everyone’s body and condition is different you should consult with your Dr. but what the heck here we go!” she wrote. Heat therapy increases your body’s oxygen flow and adds nutrients to the muscles. Applying a hot pack, taking a steamy bath or shower, helps to heal any damaged tissue. The heat stimulates the sensory receptors in the skin — meaning by placing heat to the lower back, it should eliminate the transmission of pain signals to the brain and partially relieve any discomfort. You want to apply your preference of heat for about 15 to 20 minutes at a time. Consider an all-day heat wrap, which is available in most local pharmacies. If you are using an electric heating pad, avoid falling asleep while the pad is on. “When my body goes into a spasm one thing I find really helps is infrared sauna,” Lady Gaga said. “I’ve invested in one. They come in a large box form as well as a low coffin-like form and even some like electric blankets! You can also look around your community for an infrared sauna parlor or homeopathic center that has one. Now we understand that we all don’t have a GLAM (glamour) or MED (medical) squad on deck, but her general idea of heat therapy is genius. Consider venturing to a local gym that has a sauna or even a handy dandy heating pad — hey you could even buy enough heating pads to cover your entire body or a simple electric blanket will do the job. Cold therapy means you are exposing your body to cold temperatures in order to combat small tears in muscle fibers and resultant pain. An ice bath is thought to constrict blood vessels, flush waste products, reduce swelling, and tissue breakdown. If hearing the word ice bath scares you just a little bit, consider filling the tub with cold water first. Then, instead of adding ice and letting the water get cold, jump in right away and submerge yourself entirely. Next, add the ice. This way, the water gradually gets cold, allowing you get the to full benefit of the ice bath without starting off completely numb. “In order to not overheat my system and cause more inflammation I follow this (her heat therapy) with either a VERY cold bath, ice bath (if you can stand it, it’s worth it) or the most environmentally savvy way is to keep many reusable cold packs in the freezer (or frozen peas’ n carrots’!) and pack them around the body in all areas of pain,” she explained. For any of you who want to go the cold pack route, you could use a commercial cold pack (pre-packaged so all you have to do is apply to painful area). Cold packs should be used at least three times a day for 10-15 minutes a time to reduce inflammation, swelling, and pain. Or, you can opt for an ice-towel. Towels can be soaked in cold water, wrung, and placed in the freezer for 15 minutes to produce an ice towel that can be placed anywhere on the body for about 15 minutes at a time. “Cold packs and heat packs can both be beneficial to back pain, depending on the specific source of your problem,” reported Dr. Daniel Roth is a board-certified chiropractor in Williamsburg, Virginia, and owner of the Williamsburg Neck and Back Center. Grab your frozen veggie pack of choice and relax in an ice cold bath — like Lady Gaga said, if you can stand it. She recommends alternating between hot and cold therapy. Sorry fast food lovers (BackerNation included), but a weight gain from poor eating habits has a negative impact on your already painful back. An overweight core places pressure on your back and spine increasing your chances of prolonged back pain. And boy do we get that statement. We already have you covered. Maybe we can thank our school systems for keeping us well rounded enough to cover all of the basis. Thank you academia. It seems pretty obvious that in order to lose weight, you need to keep it moving. Doing so builds that strong belly to put less pressure on your back. Now how you remain active is completely up to you. Maybe you need more than a gym buddy. If that’s the case, consider a physical therapist. A physical therapist may focus on decreasing your pain with either passive or active therapy. Whether you choose active therapy in the form of aerobic exercise, core exercise, postural exercise or passive therapy such as massages, meditation, acupuncture or chiropractic care just know that Lady Gaga approves. Exercise of any kind has been proven to display massive amounts of reduction in pain and disability — meaning, if you can force yourself to stay active or find a physical therapist to do that for you, the pain should decrease; therefore turning your disability into an ability. The Queen of Pop is well deserving of her title — with global album and single sales of 27 million and 146 million respectively, she is literally one of the greatest musical sensations of our time with a heart of gold. She gets us, people. She gets us. When deciding which remedy to take, go back to the beginning, the early days, school. It’s all about being well-rounded and Lady Gaga proves this in her many ways she chooses to ease her pain — physical and mental. Chronic pain touches an estimated 100 million U.S. lives alone, according to The Institute of Medicine of The National Academies yet pain is not something people openly share. But celebrities such as Gaga herself are beginning to open up, shining a light in the darkness to help us chronic pain warriors feel less alone and more positive in an often isolating condition. If you gain anything from this read, gain the fact that Lady Gaga sets herself apart from the rest by not fitting in — by not sitting perfectly into the box society wants so hard to put us all in. Macey Bernstein is a content specialist with a passion for crafting useful and actionable content that improves the lives of her audience. She is a dedicated reporter with a nose for news, a love for community, and a reputation for impeccable ethics. From writing press releases and legal briefs to event planning and execution she displays exceptional skill in journalism and creative direction. Macey is a graduate of the West Virginia University School of Journalism with a bachelor’s degree in journalism and public relations.